WASHINGTON CITY – A man had to be flown to the hospital early Friday morning after being injured by a 30-foot fall in a rugged area just outside of Washington City. Around 9:30 p.m. Thursday, the Washington City Fire Department was notified that a 43-year-old man hiking with a young group nearby had fallen in the rocky desert area northeast of the fire station on Buena Vista Boulevard. The man had fallen in the vicinity of a municipal water tank and injured his right ankle and shoulder, Washington City Firefighter Michael Harris said. Though injured, the man remained awake and alert, he said. While firefighters were able to drive and hike up into the area where the fallen hiker was located, Gold Cross Ambulance remained on standby at the northern end of Main Street just passed Arrowweed Drive. Washington County Search and Rescue was called in to assist with getting the man out of the area due to the rugged, rocky terrain, as well as their experience with nighttime operations, Harris said. As the operation progressed, it was determined that flying the injured man to the hospital would be more beneficial than attempting to pack him out of the area to the waiting ambulance. Mercy Air out of Mesquite, Nevada, responded to the incident due to Life Flight already being sent to a motorcycle crash near New Harmony. After dealing with some landing zone issues, Mercy Air was able to touch down. 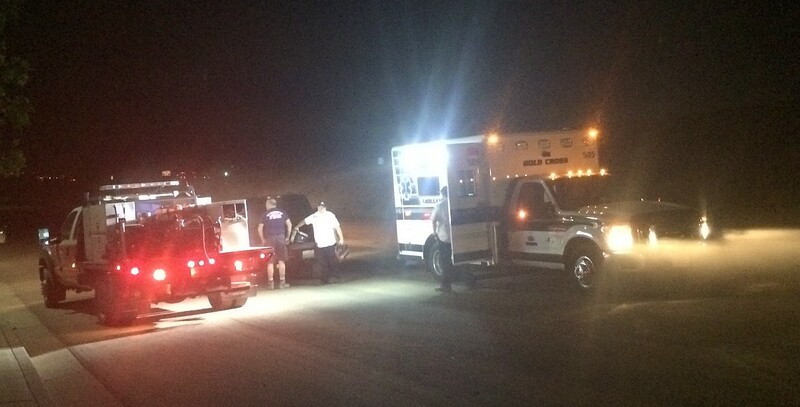 The injured man was subsequently flown to Dixie Regional Medical Center in St. George for care. The operation wrapped up shortly after 12 a.m. Friday.